CRM software is best described as a tracking system for your customer relationships. 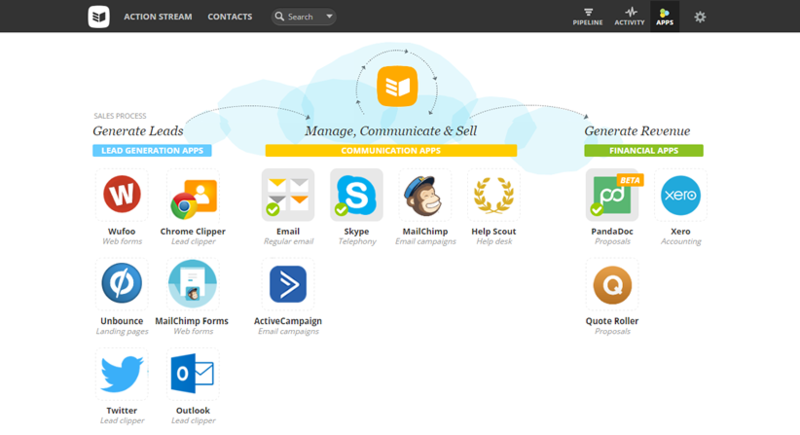 A CRM helps you manage your client lists, by recording the sales cycle from lead to customer. A great CRM system will allow a company to automate and integrate its Marketing, Sales and Customer Service activities. When your CRM is at the heart of your business, your customers are too. At OnePageCRM we champion start-ups, helping you get organised from day 1 – so that when the customers start calling, you’re ready. Here are just a few of the benefits a CRM can bring to your business. To close sales you need to be able to track your communications with prospects. Your CRM keeps all your interactions with your customers and potential customers in one place, keeping you focused, while replacing manual processes that create organizational inefficiencies. With OnePageCRM, your Action Stream becomes your ‘to-do list’ as each sales action with a contact appears in order of urgency. As each action is set as complete, you begin to nurture real relationships with your customers. What’s more, as OnePageCRM is a 100% shared database, you can ensure your sales team are working together towards one unifying goal. Lead Generation and lead nurturing are vital to the success of any business. A great CRM will help you nurture your contacts through the sales funnel, from lead to customer. At OnePageCRM, we maintain a specific focus on lead generation. 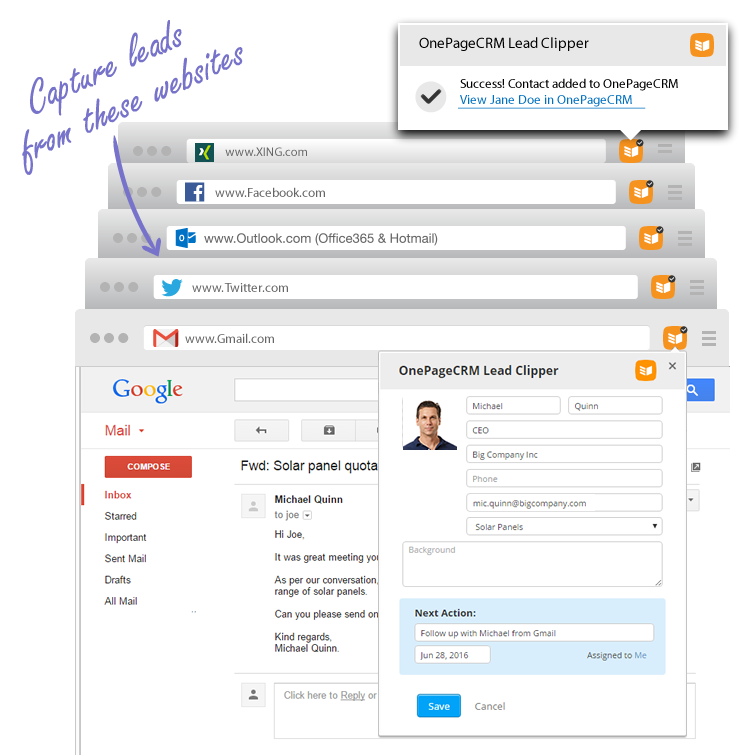 We’ve created the OnePageCRM Lead Clipper to facilitate efficient lead generation with zero admin. Using the clipper you can pull potential leads straight into the CRM from their social profiles on Xing, Twitter & Facebook and also from Gmail & Outlook online. Once the contacts details have been successfully imported, you are prompted to set a Next Action to ensure you always follow up with your new leads. The major benefit of cloud-based CRM systems is the ease at which you can build your business around it. An entire sales ecosystem has been created around the CRM industry, with cloud accounting apps – Xero, email marketing campaign apps – Mailchimp and form builders – Wufoo, to name a handful. 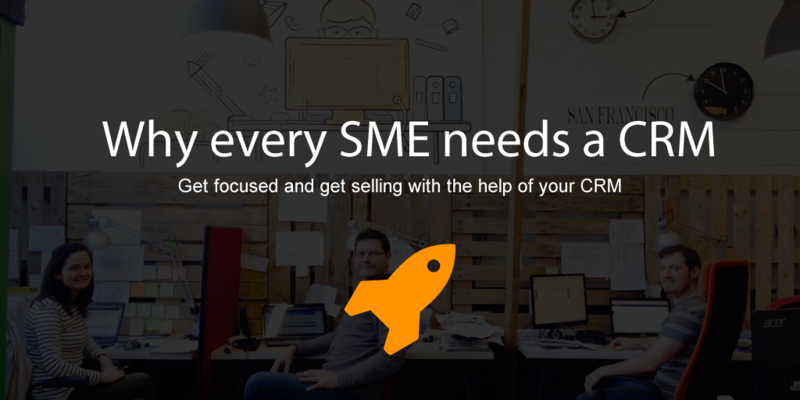 Many of which offer free packages to SME’s, saving you time and money. The days of employing software engineers to choreograph installations, only to have them return 3 months later, to update the now outdated software, are long since passed. By using a cloud app, you eliminate installation costs and as there is no hardware, you can be up and running often within a matter of minutes. What’s more, updates are included in your monthly subscription so you no longer have to worry about your system being outdated. As a startup being able to review the success of your sales activities is important. However, we understand that presenting data laden sales reports is not the solution. 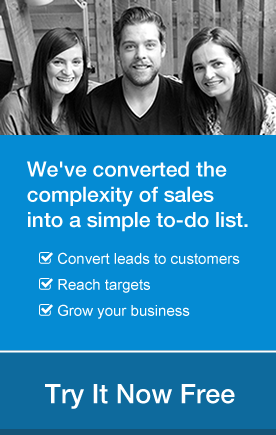 In keeping with the OnePageCRM ethos, we’ve simplified sales reporting with our intuitive Sales Pipeline. The Sales Pipeline tracks the progression of deals through the sales funnel. The deal stages are fully customizable so you can modify them to suit your industry. Your Sales Pipeline is your core forecasting tool and gives you an uncluttered view of expected future revenue. Finally, you can use your Sales Pipeline to motivate your team. Clearly identify how your sales teams are progressing with their prospects and how close they’re coming to achieving their targets. OnePageCRM started off as a napkin sketch six years ago and was built with startups and SME’s in mind. Like all entrepreneurs, we strive to create something different, something of value. We understand that a great CRM is not just a data management system, it’s a sales tool. Our Next Action Sales methodology, developed exclusively for OnePageCRM, was inspired by David Allen’s GTD Productivity Principles. By converting the complexity of CRM into a simple ‘to do list’, OnePageCRM keeps your head clutter-free and your confidence high as you’re staying on top of your contacts and sales. Download our getting started checklist below and see how OnePageCRM can help you get sales done! Want to hear more? Sign up for a weekly webinar.